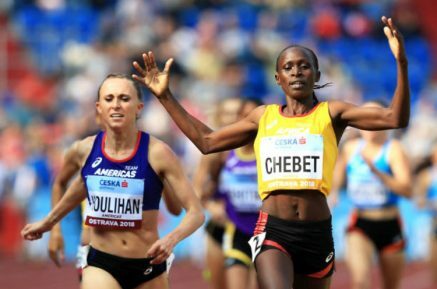 9th September 2018 – Winny Chebet (KEN) ended her season on a high with victory at the IAAF Continental Cup in Ostrava, Czech Republic. After winning the African T&F Championships earlier in the year and therefore earning the right to represent her continent, Winny ran a brilliant tactical race and showed she still possesses the closing speed that made her a 1:58 800m runner. Leading the early laps with a 72 and 76, Winny relinquished the lead with 600m to run. However, she always stayed in a position to attack and with 200m remaining hit the front again and stormed home to cross the line first in 4:16.01 with a 56 second last lap. European Champion Dina Asher-Smith (GBR) and NACAC Champion Jenna Prandini (USA) took second and third places respectively in the 100m before both playing key roles later in the day as their 4x100m teams took second (Dina, Europe) and first (Jenna, Americas). Shamier Little (USA) capped a consistent season with another sub 54 second clocking in the 400m hurdles, taking second place here in 53.86. Hellen Obiri (KEN) was involved in a high quality 3000m and finished her season with a third place in 8:36.20. Finally, Matthew Hudson-Smith (GBR) took fourth place in the 400m before putting the European team into the lead after the opening leg of the 4x400m. Unfortunately a misplaced baton later in the race saw the team disqualified.